My dear sister Claudia sent me this darling rabbit this week. Actually many of you have seen this bunny before, she is the famous Ms Maggie from Alicia Paulson. I gave this kit to my sister two years ago because I did not have the time to make Ms Maggie, and to be honest I thought I was going to screw her up big time. Here comes Claudia to the rescue. She had already made one for herself so I knew she could do it. Imagine my surprise when this came in the mail. I was sooooooo excited. Isn't she adorable? Now we know it took Claudia a bit to make her but to be honest she has been very busy. Thank you Claudia from the bottom of my heart, she is even better than I had dreamed. You did a fantastic job with her. You are the best sister ever! Now for two very reluctant bunnies. 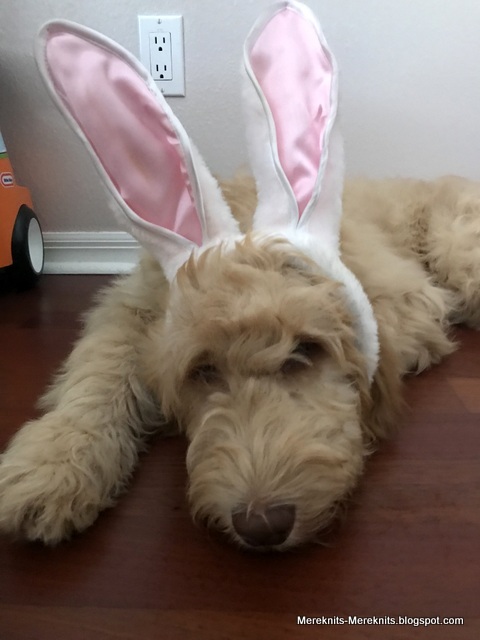 This is in honor of Claudia who took a photo of her dear Scoutie every year with bunny ears on. I have to say these two were not thrilled with this idea and had to be corralled to get these less than perfect shots. You should have seen the other photos that were just a blur of ears and fur. 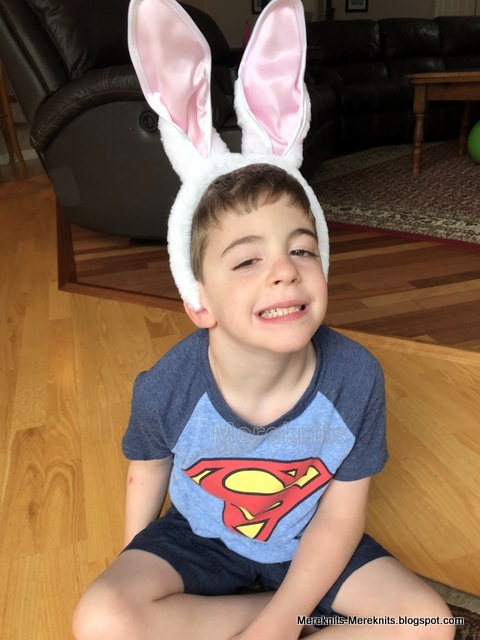 They sure make pretty cute bunnies! And the best bunny of them all is Little Buddy! He is glasses free for a week or two as we order new ones. Bear got Little B's glasses off the table on Monday morning and before we knew it they were broken and the lenses scratched. We have had to order new ones and of course there was a mix up with the prescription. Anyway he will have the new pair by the end of next week (actually two, I ordered a spare.) I forget how beautiful Little Buddy is, those glasses make him so cute but he really is a beautiful little bunny, don't you agree? Happy Easter to all who celebrate. I hope you all have a terrific Sunday. Happy Easter to you and the family.We are going to our daughter's tomorrow and have been promised a games filled afternoon with our granddaughters and some yummy food. Look at all those adorable bunnies!!! I love the stuffy. I need a stuffed bunny since I am always the host for Easter. I have very little in the way of Easter decor. For me it's all about the candy. You have three of the BEST bunnies in the world!!! I can't believe how much Little Buddy has changed --- he looks so grown up. And your furry bunnies -------oh my ......they are ADORABLE! Your sister did a beautiful job on the sewn bunny. She is very talented. As for me .............very, VERY happy to be spending spring back home. We do love it here. Hoppy Easter to you and all your adorable bunnies! I love him in the glasses, but without you can see his beautiful face even better. I love the bunny that Claudia made you. Enjoy your Easter! Happy Easter to you and Claudia and to all your family. 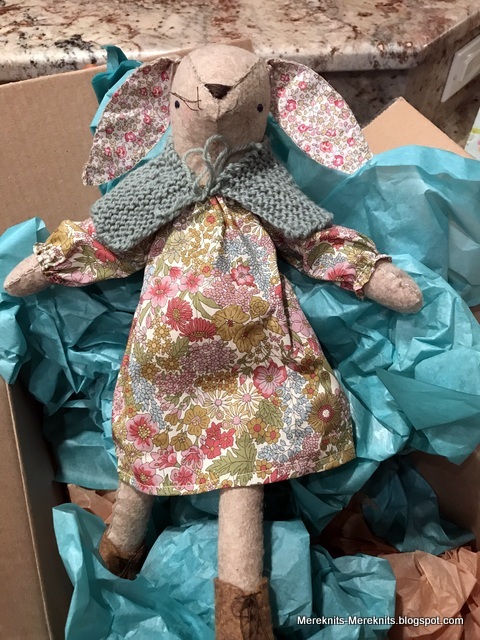 What a treat your new handmade bunny is - Claudia is talented and such a sweet thing for a sister to do. You are so lucky to have each other. I love ALL your bunnies - the willing and the reluctant. We got an extra hour of sleep today as daylight savings finished overnight. Hoorah! More energy for the next item on the agenda: an Easter egg hunt for my children. Even though they are almost fully grown, they still love a good hunt; so as they get older, the Easter Bunny gets trickier. Last year I stumped them and came across the remains of two hidden eggs in September! Such adorable bunnies! Happy Easter to you! I saw Claudia's post on Instagram about the bunny she was sending. Really very sweet. 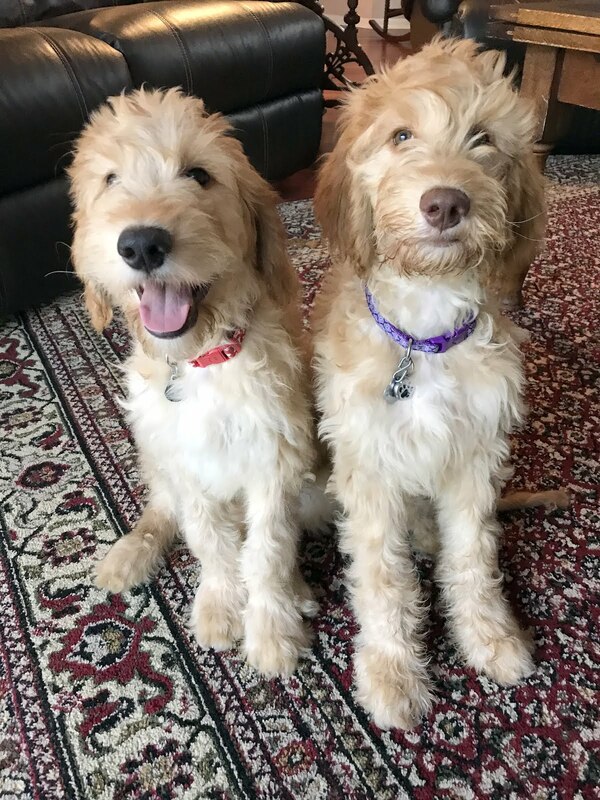 As are those pups in bunny ears. And, of course, Little B. Easter blessings to you all. Happy Easter to three adorable bunnies and gorgeous gifted bunny. I have to say though, the last photo is the bets one. You've got a houseful of cute Easter bunnies. I really love those Ms Maggie bunnies, so cute. I'd order one myself if only I had some sewing skills. Happy Easter. These are the BEST bunny pictures!!! Happy Easter to you Meredith!! What a lot of cuddly bunnies! The Official Easter Bunny has some stiff competition. every bunny here is wonderful! the sweet sewn bunny and the non cooperating puppybunnies and the best (with or without his glasses) beautiful bunny of our hearts! So many cute bunnies!!! Happy Easter to all of you!! Sweet bunnies, particularly the last one! Happy Easter to you and yours. The stuffed bunny is incredible! The bunny ears are fun on all three boys! I do agree entirely! You saved the best for last, but they are just wonderful, little bunnies. Happy Easter! Love all of your bunnies, especially the LB one! Hope you had a wonderful Easter, Mere. Such a joy to visit and catch up. Little Buddy is indeed an adorable bunny and those two puppies are a real delight. Thank you for the wonderful images. Oops on the glasses. Lil Buddy is the most darling. Easter, the joy the promise...its all good. While we were away it didn't feel like Easter, but with my kids it was a precious appreciated great day. Nice bunnies...stuffed..4 legged....2 legged! How nice of your sister to surprise you that bunny! We had fun with our grandchildren pm Easter in a park. Chilly but fun. Hope you had a good week! Hugs. Good thing to order 2 sets of glasses for Buddy! 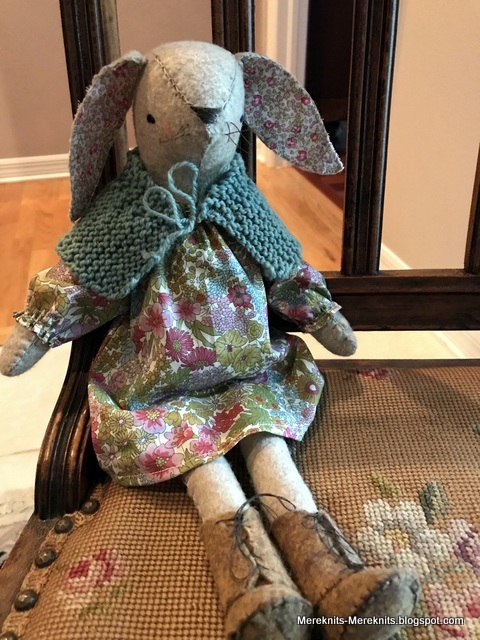 I love the bunny that Claudia made for you - but I did see it ahead of time on her blog and IG. 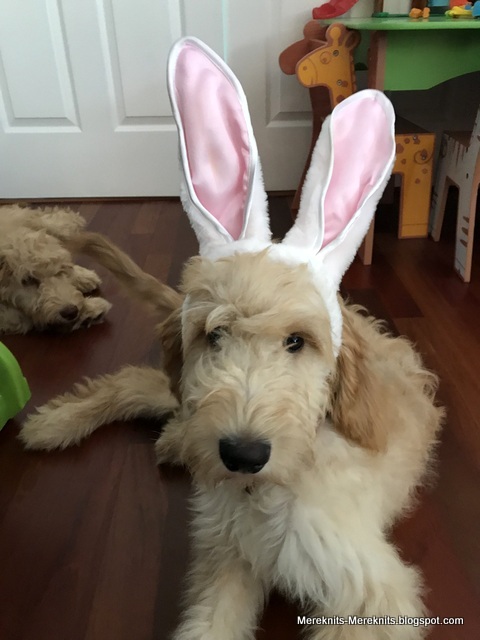 ;-) Your pups sure are cute but they don't look too thrilled with the bunny ears! Little Buddy doesn't seem to mind wearing them...and yes, he certainly is a beautiful boy. I'm behind, so I hope you and your family had a lovely Easter. What goes around comes around :-) I love Ms. Maggie, the fabrics are gorgeous. Thanks for the sweet post on Easter!